Chloe Chaidez of KITTEN crowd surfs at The El Rey. 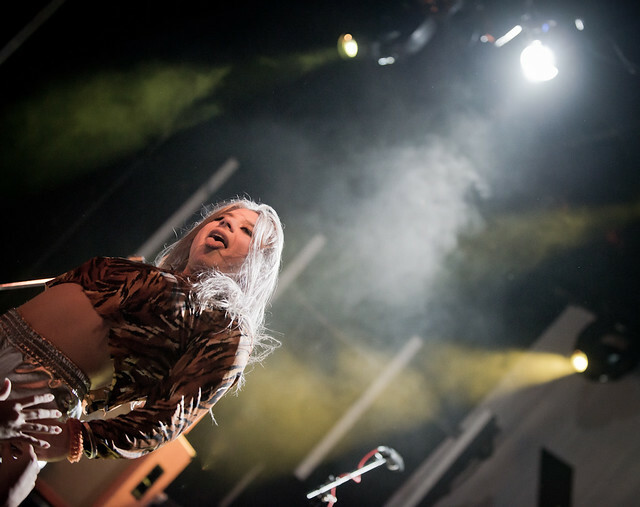 LA band Kitten brought their glitter-glam rock wrecking ball party to the El Rey Theater where a home town crowd welcomed them with open arms; a sea of sweaty bodies that swelled as soon as the curtains raised revealing the electro-glam darlings. 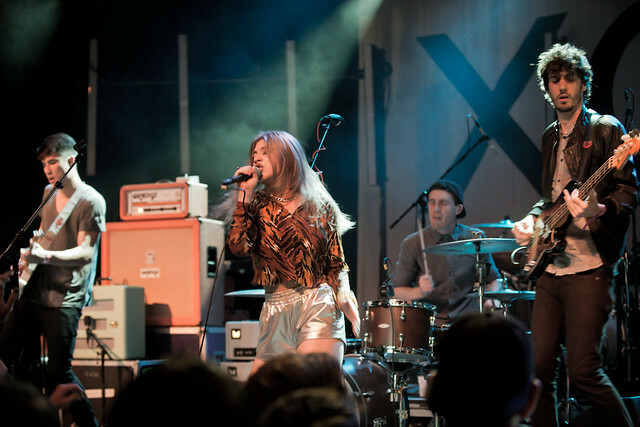 Already opening for such bands as Paramore, No Doubt, Joy Formidable and Garbage, Kitten continues to add to their already impressive resume by touring with Brit sensation Charli XCX. This night, the crowd was energetic - maybe because Kitten was playing to a hometown crowd or because the original date, scheduled for last month was rescheduled a month later. Either way, the crowd was just happy to watch Kitten perform and Chloe rewarded them by jumping into the crowd, jumping off speakers and crowd surfing. At one point, she even pulled a fan in the front row and gave him a kiss. They ran out of the gate with "Japanese Eyes," a dizzying opener that threw the crowd into a frenzy. Chloe, in flexible, breathable, satin shorts, always performs like she's been holding up some pent up energy, waiting until the very last minute, right when she gets onstage, to release all that intensity into an explosive fireball. Showing they can go from 0 to 60 in a split second, Kitten's set is highlighted when they slow it down with their glitz-romance, shoe-gazey songs "Cut It Out" and "G#" which gave a everyone a lift, transforming the El Rey into one drug-induced high. - even Chloe who climbed up the high speakers and jumped off, momentarily suspended in mid-air and landing softly on the stage below. That led to an inspiring cover of Prince's "Purple Rain" which, in the hands of Kitten, turned Prince's emotional, gospel-inspired love song into a suffering, rock ballad. Kitten's Chloe Chaidez at The El Rey. Kitten, touring and supporting their latest EP, Like A Stranger, sang two songs off it - "Doubt" and "Like A Stranger" while "Sugar," off their first EP Sunday School had her climbing up towards the rafters fifty feet off the ground; no safety nets required - leave it to Chloe who is a professional rock star. They ended their set with their usual wrecking ball of a song "Kitten With A Whip," one of their few early songs they end with at all their shows that finished off with nearly the entire crowd crashing the stage and dancing. Having released three EP's since their formation four years ago, they've shown that they have a sound all their own -from moody-synth pop to electronic-hazy alternative songs that echoes vintage 80s disco and rock. Their fiery performance, one not to be missed, will blow you away and has gotten more dizzying and electrifying since they formed four years ago. Lead by the spark-plug of a singer, Chloe Chaidez, the band's electrifying stage presence is contagious that bleeds out into the audience. This explains why musical powerhouses in the past, like Paramore, No Doubt and Joy Formidable has asked Kitten to support them on tour. This time around, they're traveling North America opening up for Charli XCX that began last month in Seattle, go through Canada to New York and will end in Houston, Texas at the end of November.